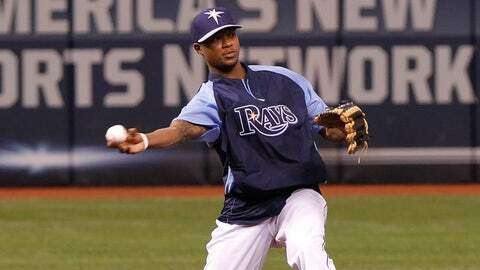 Tim Beckham, who made his major-league debut against the Rangers in September, was the No. 1 overall pick of the 2008 draft. Tampa Bay Rays infielder Tim Beckham had successful surgery to repair the ACL in his right knee Tuesday, the team announced Wednesday. Dr. James Andrews performed the procedure in Pensacola, Fla.
Beckham, 23, is expected to miss six to eight months as he rehabs. The former first overall pick tore the ligament during a workout last week. He made his major-league debut Sept. 19 against the Texas Rangers, and he hit .429 with one RBI in seven at-bats over five regular-season games. The Rays also announced that right-handed pitching prospect Ryne Stanek had surgery to repair his right hip labrum Tuesday. He’s estimated to return sometime in the middle of next summer. Stanek, an Arkansas product, was drafted 29th overall last June.